Daniel Jones remained in the mercantile business until 1864, when he associated himself with the late S. Ford & Co. in the manufacture of woolen goods, and later conducted the business under the name of D. Jones & Co. He continued this business till 1877 when he leased it to D. P. Price. [advertisement] Wanted: 50,000 lbs. 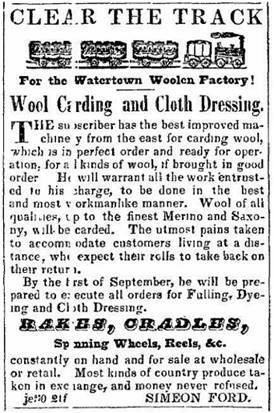 of Wool, for which will be paid cash the highest market price at the Watertown Woolen Factory. Farmers and wool growers having wool to sell for cash, exchange for cloth or woolen yarn, will find it to their interest to give me a call. I have on hand and am constantly manufacturing woolen cloths of all varieties, also woolen yarns of different grades and color, to exchange for wool and sell for cash, on better terms than ever before offered in this market. Custom Carding—The Mammoth carding machine has been covered with new cards and is in the first order for roll carding which will be promptly attended to. Customers living at a distance can have their rolls carded the same day to take home with them. Wool must be clean in good order. Same 06 07 WOOL! WOOL! [advertisement] Wool! Wool! Connected with the best eastern markets, we are now ready to pay the highest market price in cash for wool and respectfully solicit all having the article for sale to give us an opportunity to bid. This old and well-known manufacturing establishment has recently been so greatly enlarged and improved that it may now be called a new institution. Mr. Daniel Jones has associated himself with Mr. S. Ford in its management and the work it does and the cloths it furnishes are of the best quality. A new water wheel, shafting, looms, shearing and brushing machines have been supplied, all of the latest invention, which doubles the former capacity of the factory for work and enables the proprietors to execute all orders with the utmost neatness and punctuality, so that those living at a distance can always have their rolls to take back with them the same day the wool is left for carding — providing, of course, too many do not apply at the same time, which is sometimes the case, when each must take his turn. A great variety of cloths, such as cassimeres, fulled cloths [? ], tweeds, plaids, colored and plain flannels, of all widths, are now manufactured at this establishment, which for firmness, finish, durability and service, are fully equal to any others made any where, and all who have tried them bear willing testimony to their excellence and admirable wearing qualities. The factory is now in the best running order and is kept so. Nothing is wanting to enable it to do all kinds of work with entire satisfaction and promptness. Farmers can have their wool worked on shares, or exchange it on the spot for any kind of cloth they may prefer. No care is spared to satisfy and accommodate all customers. Immediately on the north side, and within 40 feet of the Empire Mill is situated the Woolen Factory, owned by Mr. Daniel Jones, and containing valuable machinery and stock, and adjoining this building is the Sash and Door Manufactory of Mr. G. B. Lewis. As a precautionary measure against fire, Mr. Smith had surrounded his mill, which was a frame building, with brick walls, and the saving of the Woolen Factory is mainly due to this fore thought on the part of Mr. Smith for all endeavors to save this building would have been unavailing had not the north wall of the mill stood as a barricade between the intense heat and angry flames and the Woolen Factory. The flames made rapid progress and the devouring element held full sway over the doomed building. The brick wall, however, still stood the severe strain and test, and the question as to the safety and destruction of the Wollen Mill, hung, as it were, in the balance, and could only be determined by the manner in which the wall nearest the building would fall. A loud shout rang from the vast throng when it was seen that the wall fell favorably, the Wollen Mill was saved and the further destruction of property saved. Mrs. Simon Ford, a former resident of Watertown, died at Minneapolis last Monday, aged 102 years. Her remains were brought here on Wednesday and interred in Oak Hill Cemetery. Deceased was born in Seneca County, New York, in 1808. November 2, 1828, she was married to the late Simon Ford at Lockaport, New York, and in 1844 they came west and located in this city, where Mr. Ford built and operated a woolen mill on the west side of Rock River, just north of the Globe Mill. The family resided for many years in the house now occupied by E. L. Bartlett,  Washington Street. Mrs. Ford is well known to the older residents of Watertown, and all her old friends mourn her death as that of a most excellent lady and an old neighbor for whom they have the highest regard.